Larry Yee for generous provision of his photographic survey of the exhibition in Brooklyn. 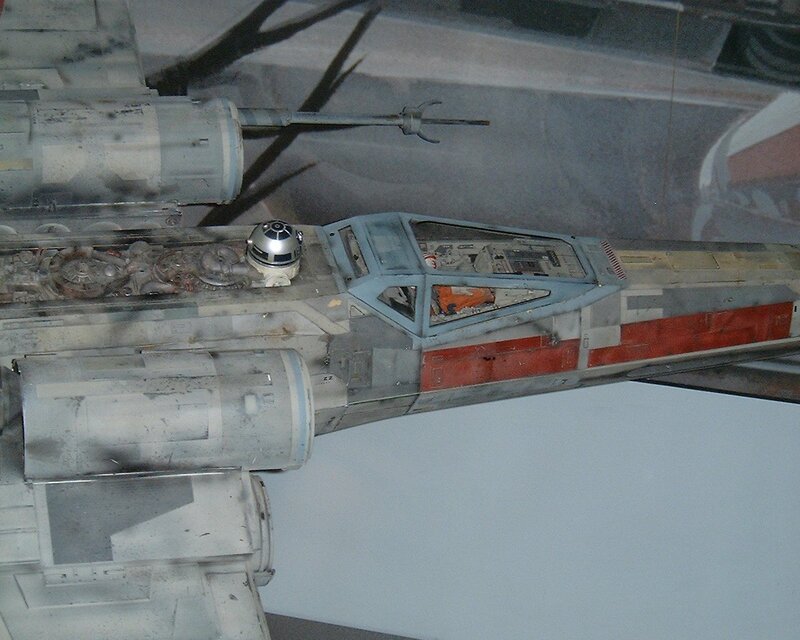 Rear starboard view of an X-wing fighter. The three stripes on each wing indicate that this fighter is Red Three (if it was one of the fighters at the Battle of Yavin). The adstromech droid's colours are similar to those of R2-D2. By considering the astromech's head as a yardstick, it is obvious that this rebel starfighter is in a far greater class of mass than prequel-era fighters such as the diminutive, short-ranged but faster Delta-7 Aethersprite of the Clone Wars. 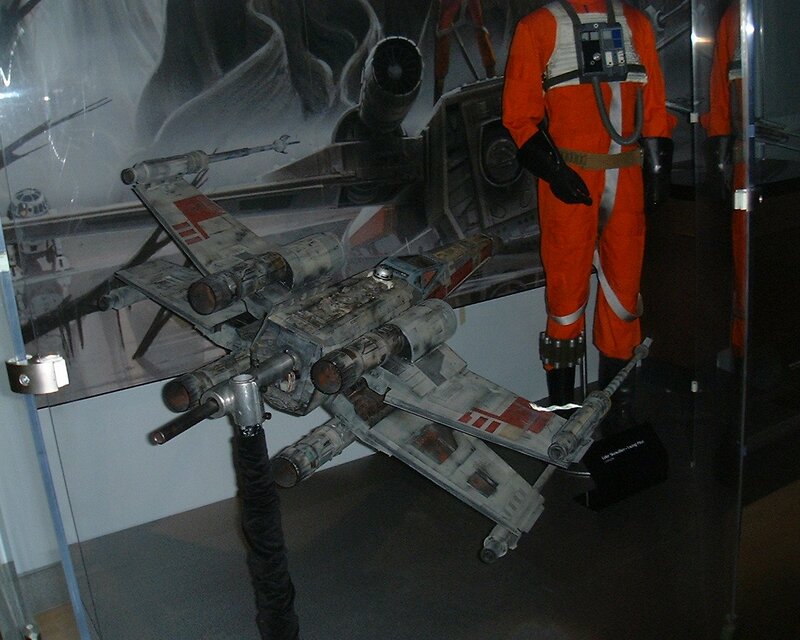 A view of the X-wing from the starboard side and above the mid-plane. The impressive size of the four laser cannons compared to fuselage (or indeed the human pilot) is easy to appreciate. The barrels of the cannons show patterns of matte and glossy areas; we may wonder whether the patterns are functional or merely decorative like the red stripes on the wings and fuselage. The pilot's helmet markings resemble the red and white design worn by Luke Skywalker. A detailed photograph of the upper fuselage, showing many fine features of the cockpit interior. The pilot wears the characteristic white gloves worn by the snowspeeder pilots and gunners on Hoth. 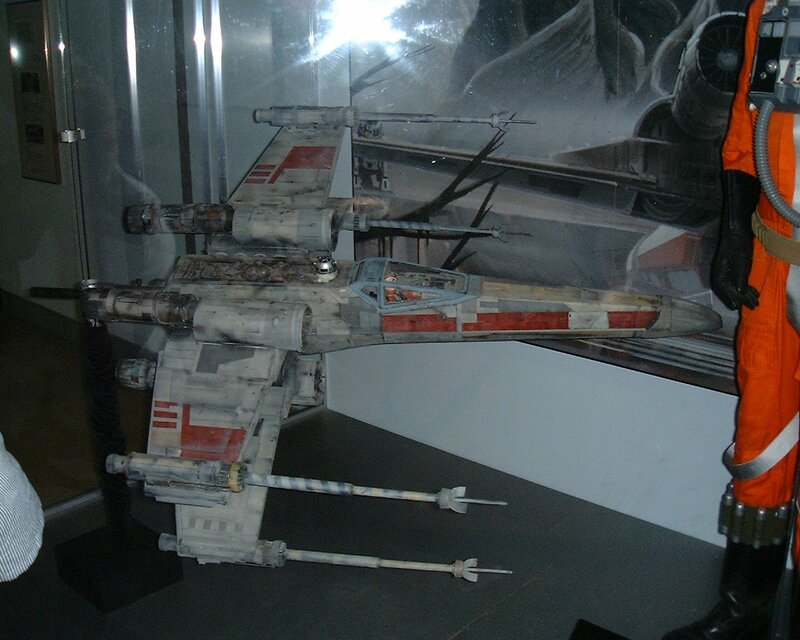 Therefore this model probably depicts an X-wing from TESB . 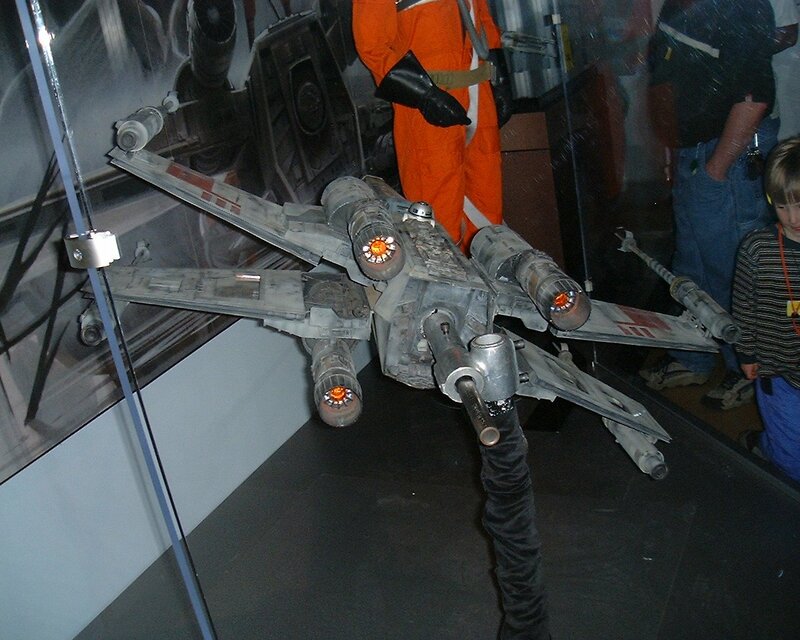 A rear view of the X-wing fighter, showing much intricate detail within the engines and also the depression of cavities on the inner surfaces of the wings. Original content is © copyright Dr Curtis Saxton 2002–2005. Online since 7 July 2002. Last updated 20 November 2005. Original photographs from the Powerhouse exhibition, within and linked from this page, are © copyright Curtis Saxton 2002. Original photographs from the BMoA exhibition, within and linked from this page, are © copyright Larry Yee 2002.